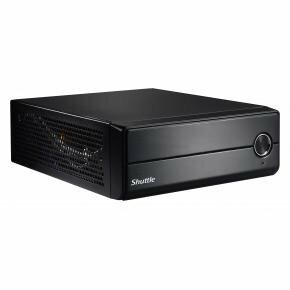 The Shuttle XPC slim Barebone XH310RV is a real roomster considering its small footprint - one optical drive, two 2.5" storage drives and an M.2 SSD card can be installed into the robust steel chassis. In addition, it supports the powerful Intel Core desktop processors with socket LGA1151v2. The built-in heatpipe cooling ensures the system runs quietly at maximum stability. Thanks to its great connectivity it meets the requirements of many applications that extends from office PC up to industrial applications. The system supports two displays with Ultra HD resolution, dual Gigabit LAN, four USB 3.0 and four USB 2.0 ports and two serial ports. With this high level of efficiency and flexibility - who needs a bulky tower PC anyway?